A so-called leader of the SDF -- the U.S.-backed group in Syria that is largely controlled and manned by the PKK/PYD terrorist group -- has admitted that they are aiming at forming their own army in the country. "We are rebuilding our own army to be ready to deal with any threat from anyone who wants to invade the cities we liberated alongside the coalition," Abdul Qader Effedili said, according to the British daily, The Times. Effedili argued that Turkey, Iran, and the regime forces would be happy to take back the SDF-controlled areas. Anadolu Agency previously reported that the PKK/PYD -- PKK's Syrian affiliate which has seized a quarter of Syrian territory -- was forming a so-called army with the U.S. support. Also previously, the U.S. said they would continue to support the PKK/PYD in Syria's eastern Raqqah and Deir ez-Zor provinces, home to some of the country's most productive oilfields. The latest news comes after the U.S. CENTCOM Commander Gen. Joseph Votel announced on Dec. 22, 2017 that they would establish border protection forces in Syria, which he said would help prevent the resurgence of Daesh. Turkish Foreign Ministry on Wednesday summoned the U.S. Embassy Charge d'Affaires Philip Kosnett in capital Ankara to express its "discomfort" over the U.S support for the PKK/PYD terror group, according to Turkish diplomatic sources. 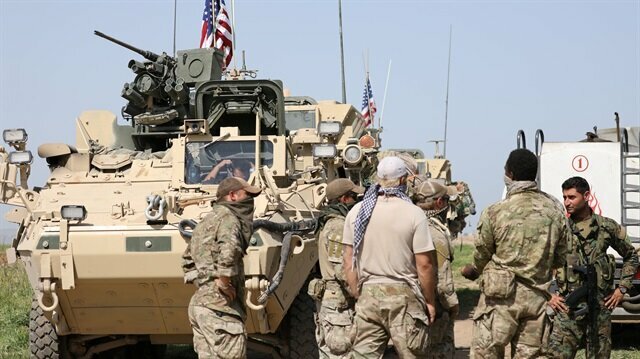 A group of around 400 terrorists were reportedly trained by the U.S. through the Pentagon and the CIA near eastern Aleppo's Tishrin Dam on the Euphrates River and in the southern Hasakah province.